Bachelor of Science, 1999-2003, Xi'an Jiaotong University, China. M.Sc. in Theoretical Physics, 2003-2006, Xi'an Jiaotong University, China. Thesis title, Realizing distributed quantum computing and generating multipartite entangled state in cavity QED system. 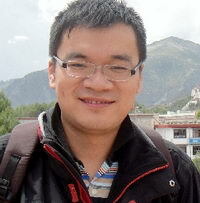 Principal thesis advisor, Professor Fu-li Li. Ph.D. in Optics, 2006-2009, Department of Applied Physics, Xi'an Jiaotong University, China, Thesis title, Quantum information processes in cavity QED and opto-mechanical systems, Principal thesis advisor, Professor Fu-li Li. September 2007 - September 2009, visiting student in Physics Department, University of Michigan, MI, USA, under supervision by Professor Lu-ming Duan. I am interested in the physical implementation of quantum computation and quantum simulation with circuit QED or optomechanics systems. I am also intereted in the foundamental of quantum mechanics and quantum information. In the last few years, I participated in several interesting research projects, such as Space-time crystal, Schrodinger's bacterium, etc. I also experimentally realized and tested the entangled history for the first time. They have got a lot of attentions. I will keep my interests on these foundamental problems in quantum physics. Major in science or engineering with good math and physics ablility. Good reading and oral english. December 2008, his paper Phys. Rev. A 75, 012324 (2007) was awarded as "2007 Top 100 most cited Chinese papers published in international journals" by ISTIC. September 2010, Outstanding PhD Thesis Award, by Xi'an Jiaotong University. Counted by Google Citations, my papers have got more than 1000 citations. H index is 17. Qizhe Hou, Wanli Yang*, Changyong Chen, Zhangqi Yin*, "Electromagnetically induced acoustic wave transparency in diamondmechanical resonator ", accepted for Journal of the Optical Society of America B.
Wan-lu Song, Wan-li Yang*, Zhang-qi Yin, Chang-yong Chen, and Mang Feng*, “Controllable quantum dynamics of inhomogeneous nitrogen-vacancy center ensembles coupled to superconducting", Scientific Reports 6, 33271 (2016). Thai M. Hoang, Yue Ma, Jonghoon Ahn, Jaehoon Bang, F. Robicheaux, Zhang-Qi Yin*, and Tongcang Li*, “Torsional optomechanics of a levitated nonspherical nanoparticle”, Phys. Rev. Lett. 117, 123604 (2016), highlighted by Physics, arXiv:1605.03990. Yizhou Huang, Zhang-qi Yin*, and W. L. Yang, "Realizing Topological Transition in a Non-Hermitian Quantum Walk with Circuit QED", Phys. Rev. A 94, 022302 (2016), arXiv:1601.01774. Zheng-Yuan Xue, Zhang-Qi Yin*, Yan Chen, Z. D. Wang*, Shi-Liang Zhu*, "Topologically-protected quantum memory interfacing atomic and superconducting qubits", SCIENCE CHINA Physics, Mechanics & Astronomy 59, 660301 (2016), arXiv:1301.4139. (3 citations). Tongcang Li*, Zhang-Qi Yin*, "Quantum superposition, entanglement, and state teleportation of a microorganism on an electromechanical oscillator", Sci. Bull. 61, 163 (2016), arXiv:1509.03763. (11 citations). Erratum to this article. Reported by Guardian, PhysicsWorld, Phys.org, 科技日报，参考消息，证券时报, etc. Shuoming An, Jing-Ning Zhang , Mark Um, Dingshun Lv, Yao Lu , Junhua Zhang, Zhang-qi Yin, H. T. Quan*, and Kihwan Kim*; "Experimental Test of Quantum Jarzynski Equality with a Trapped Ion System", arXiv:1409.4485, Nature Physics 11, 193 (2015) . (60 citations), ESI Highly Cited Papers. Zhang-qi Yin*, Zhen-biao Yang, “Distributed quantum information processing in fiber-coupled cavity QED systems” (invited review), Journal of Anhui University (Natural Science Edition)，Vol. 38, No. 1, page 1-11. Zhang-qi Yin, Tongcang Li*, Andrew Geraci, “Optomechanics of levitated dielectric particles” (invited review), Int. J. Mod. Phys. B 27, 1330018 (2013), arXiv:1308.4503. (35 citations) Recommended by MIT TechnologyReview. Zhang-qi Yin*, Tongcang Li, Xiang, Zhang, L. M. Duan; “Large quantum superpositions of a levitated nanodiamond through spin-optomechanical coupling”, Phys. Rev. A 88, 033614 (2013), arXiv:1305.1701. (63 citations). Tongcang Li, Zhe-Xuan Gong, Zhang-Qi Yin, H. T. Quan, Xiaobo Yin, Peng Zhang, L.-M. Duan, Xiang Zhang*, "Space-time crystals of trapped ions", Source: Phys. Rev. Lett. 109, 163001 (2012)，arXiv:1206.4772. (53 citations). Cover image, Highlighted by Physics and Nature. Tens of media reports, such as NewScientists, PhysicsWorld, MIT TechnologyReview, and et al.. Reply to comment: arXiv:1212.6959 (7 citations). W. L. Yang*, Z. Q. Yin, Y. Hu, M. Feng*, and J. F. Du*, "High-fidelity quantum memory using nitrogen-vacancy center ensemble for hybrid quantum computation", Phys. Rev. A 84, 010301(R) (2011). (55 citations). W. L. Yang, Z. Q. Yin, Z. Y. Xu, M. Feng*, and J. F. Du*, "One-step implementation of multi-qubit conditional phase gating with nitrogen-vacancy centers coupled to a high-Q silica microsphere cavity", Appl. Phys. Lett. 96, 241113 (2010), arXiv:1006.0278, (79 citations). Reported by 《ScienceDaily》,《PhysOrg》 and et al. Zhang-qi Yin and Fu-li Li*, "Multiatom and resonant interaction scheme for quantum state transfer and logical gates between two remote cavities via an optical fiber", Phys. Rev. A 75, 012324 (2007), arXiv:quant-ph/0606152 (204 citations). Awarded as "2007 Top 100 most cited Chinese papers published in international journals" and ESI Highly Cited Papers. Zhang-Qi Yin*, Tongcang Li*. "Bringing quantum mechanics to life: from Schrödinger's cat to Schrödinger 's microbe", arXiv:1608.05322 (review paper). Xian-Peng Zhang, Li-Tuo Shen, Zhang-Qi Yin, Luyan Sun, Huai-Zhi Wu, and Zhen-Biao Yang*, “Multi-Resonator-Assisted Multi-Qubit Resetting in a Network”, arXiv:1604.08393. Yue Ma, Zhang-qi Yin*, Pu Huang, W. L. Yang, and Jiangfeng Du*, "Cooling a Mechanical Resonator to Quantum Regime by heating it", arXiv:1603.05807. Jordan Cotler, Lu-Ming Duan*, Pan-Yu Hou, Frank Wilczek*, Da Xu, Zhang-Qi Yin*, and Chong Zu, “Experimental test of entangled histories”, arXiv:1601.02943. Qidong Xu, W. L. Yang*, Zhang-qi Yin*, “Phonon induced two-mode squeezing of nitrogen-vacancy-center ensembles”, arXiv:1512.08605. Zhang-qi Yin, Yong-chun Liu and Yun-feng Xiao, Nonclassical light sources and frequency converters with integrated opto-mechanical systems, book chapter in 'Integrated nanophotonic resonators: fundamentals, devices and applications', Pan Stanford Publishing Pte. Ltd. Singapore , 2015.